So maybe the costumes in the Harry Potter and Fantastic Beasts movies didn’t come together by magic, but Muggles (or no-majes, depending on which side of the Atlantic you are) might be jealous of the wizarding world fashion scene. 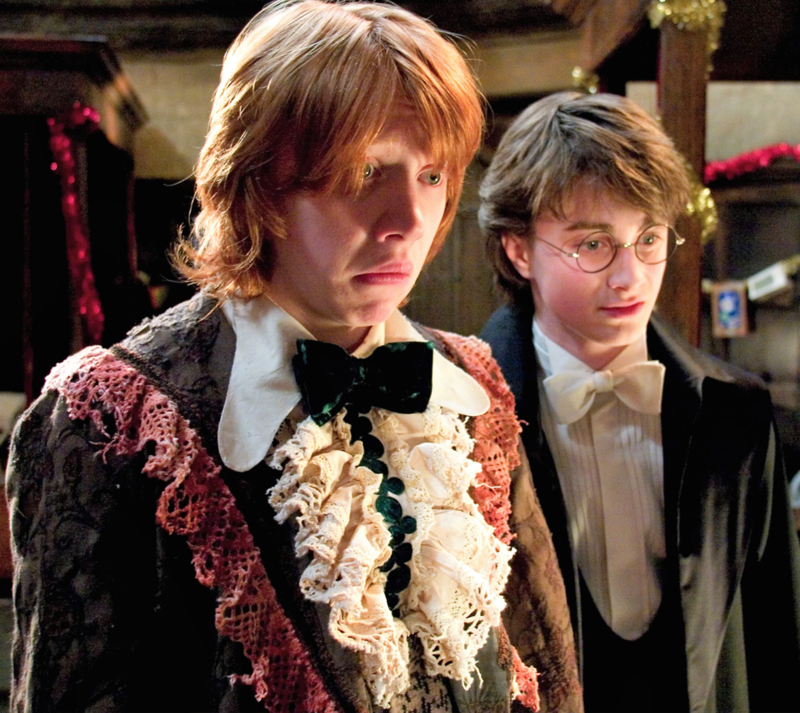 Even the strangest of outerwear won’t get you much notice in the wizarding world. 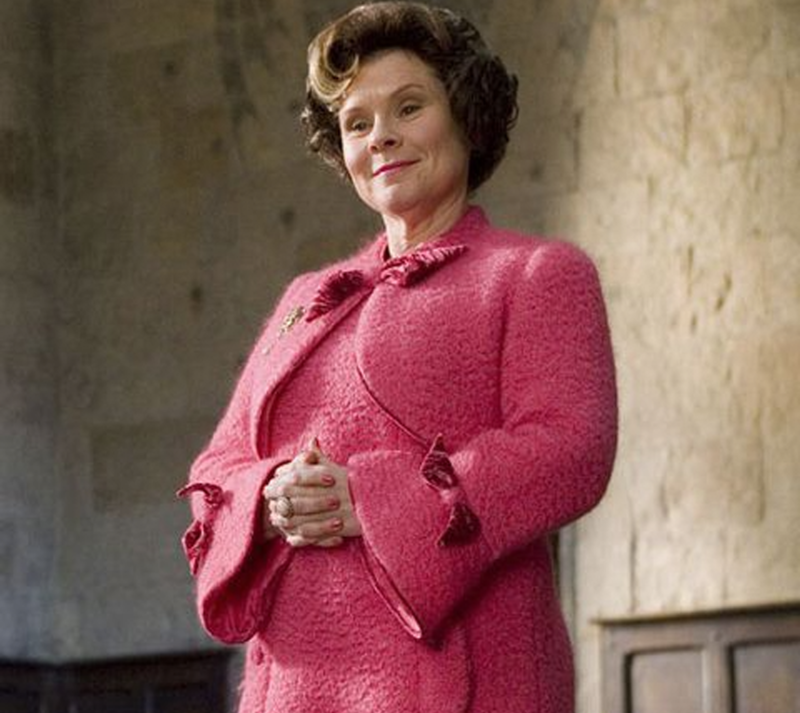 Some outfits reflect a character's personality, such as Dolores Umbridge's cavity-inducing pinks or Lucius Malfoy’s heartlessly black robes. Rita Skeeter is every inch the sleazy tabloid reporter in silk and feathers. Others may hint at the wearer’s true nature. If you were cursed to one day lose your human form and turn into a snake, you might as well wear something that at least hints at a reptilian future. From the wonderfully bizarre to the downright enchanting, see which costumes in the Harry Potter universe have us the most spellbound. 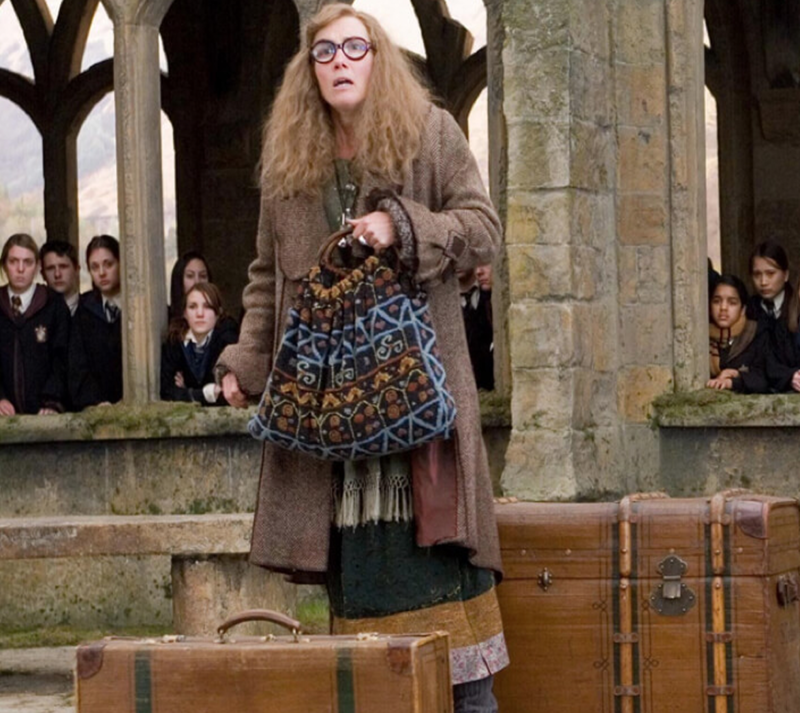 Sybil Trelawney’s fashion sense may be as inconsistent as her prophecies, but is there really any other way you can imagine seeing someone whose mind is in 13 places at once? Eccentric colors that normally shouldn’t be anywhere near one another at once strangely seem to match on her. Oh, and those glasses. Always the glasses. Someone as full of himself as Lockhart should wear robes just as flamboyant as his personality This is Robin Hood meets King Midas. 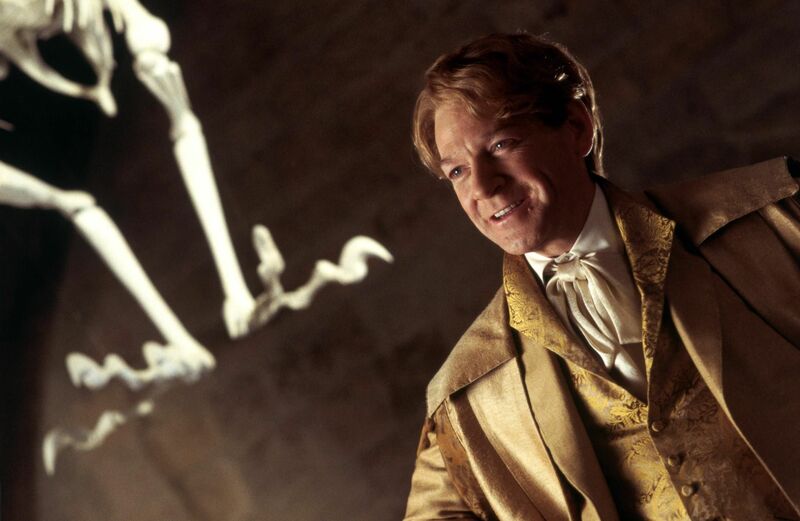 Of course, there is no fashion statement in the world that can help the totally incompetent Lockhart when Snape disarms him and sends him flying across the room. He might have wanted to Obliviate that memory. 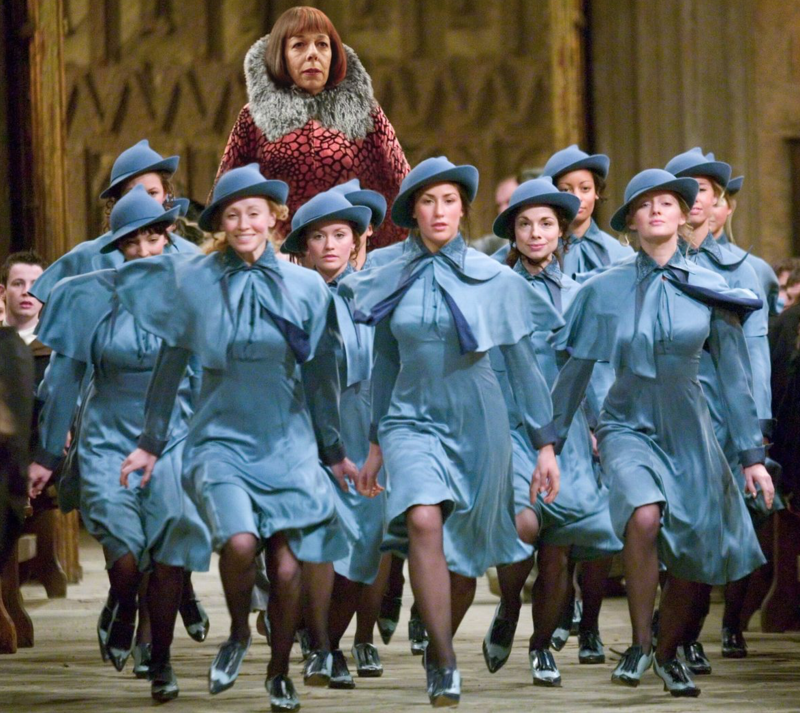 No shade to Hogwarts robes — they really have that classic witchy, wizardly look — but you have to admit Beauxbatons girls know a thing or two about the Paris runways. Those ethereal light blue uniforms seem to transform them into water nymphs, and those raindrop hats were conjured by haute couture milliner Philip Treacy. This saccharine pink tweed ensemble just screams "you can’t sit with us!" Actress Imelda Stanton actually imagined her obnoxious character waddling around like Daisy Duck, which explains why Harry Potter costume designer Jany Temine magicked up all those ruffled skirts. As she gets more unbearable, her outfits go from pink to pinker to pinkest. 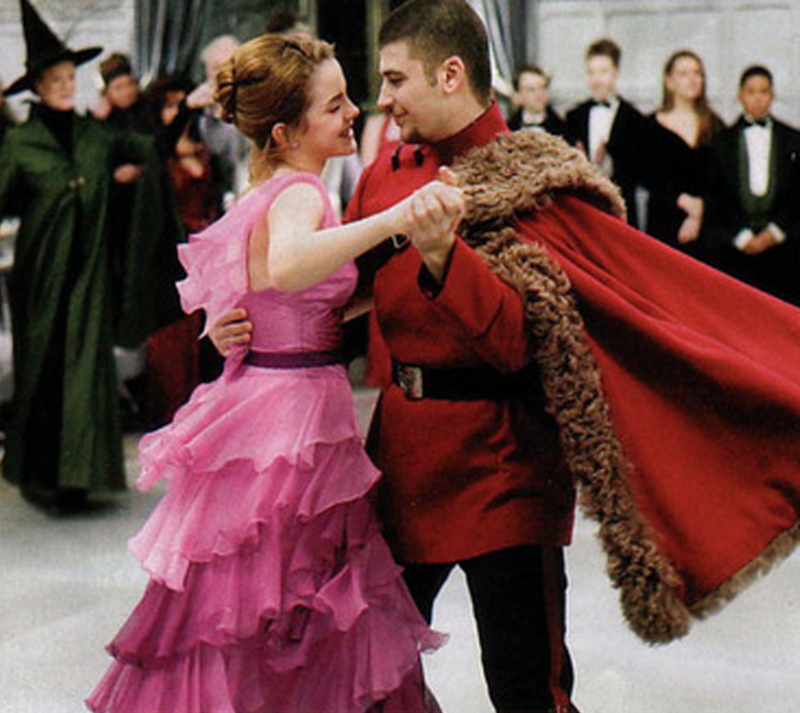 Since when did Hermione go from haunting the library and hanging with the boys to being the Sugar Plum Fairy? 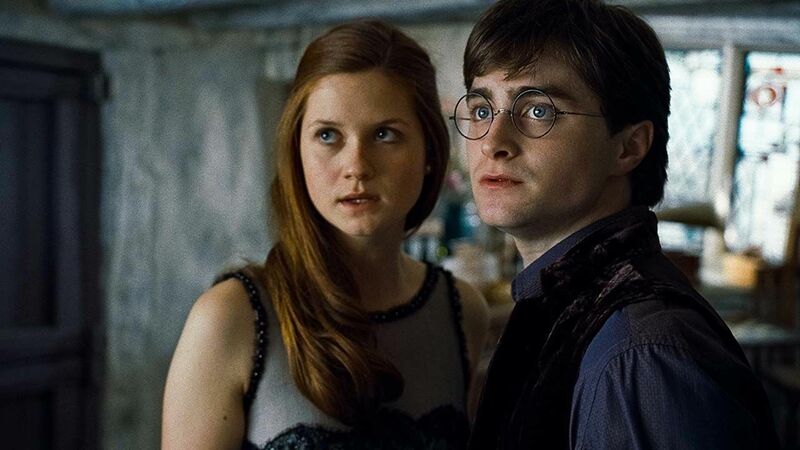 Her transformation in Harry Potter and the Goblet of Fire is magical, and it was really the first time in the Harry Potter series that Hermione was actually seen as a girl. Ron was more than a little incensed that it was through Viktor Krum’s eyes. Draco’s father might be as unforgivable as the curses he fires off, but his robes might be the most glorious thing to ever emerge from Malfoy Manor. 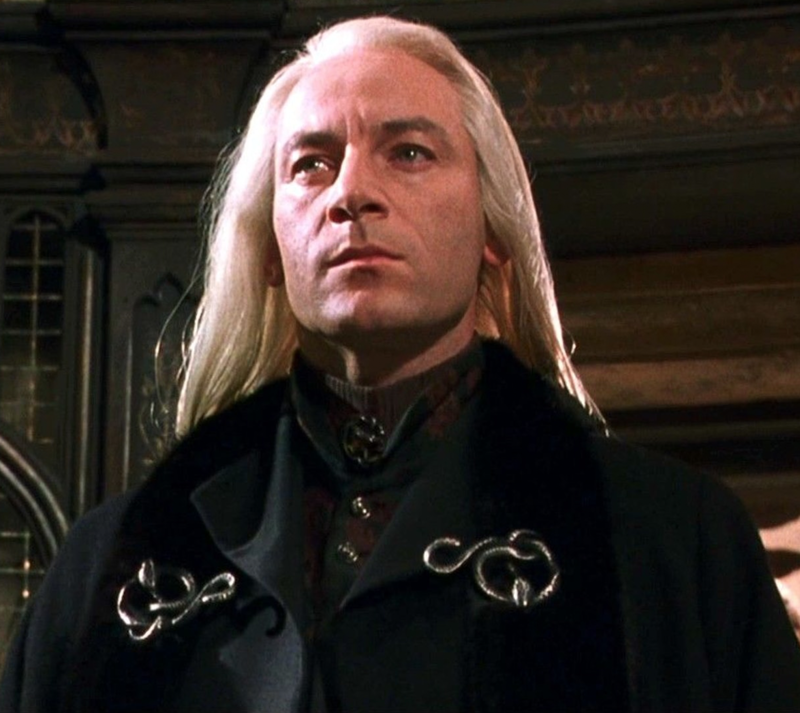 Lucius looks as menacing as he should in those long Victorian-inspired robes and serpent brooches that make you wonder what he’s hiding beside the Dark Mark. His wardrobe is black as his soul. 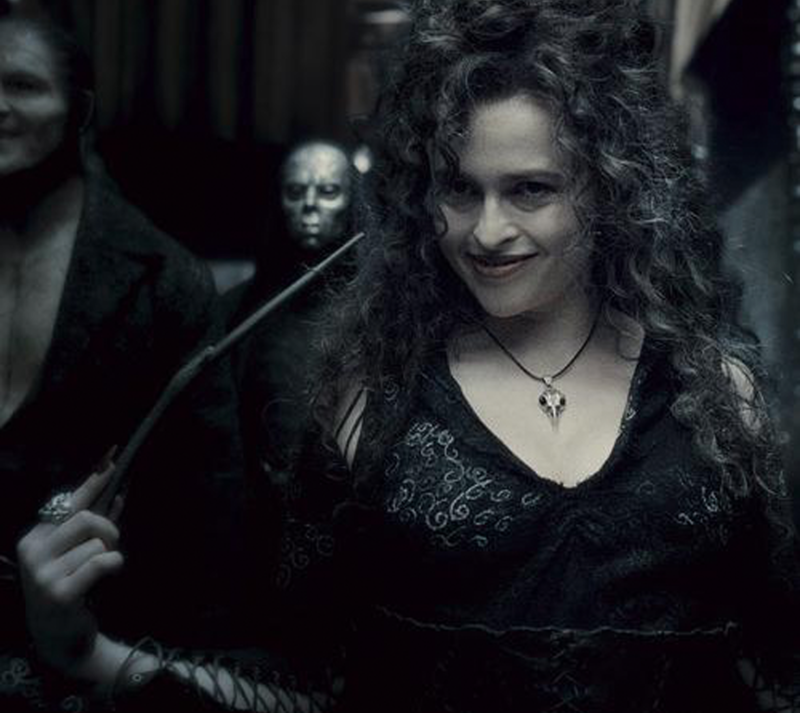 Sorry Lucius, but you have some competition in dark wizarding fashion. 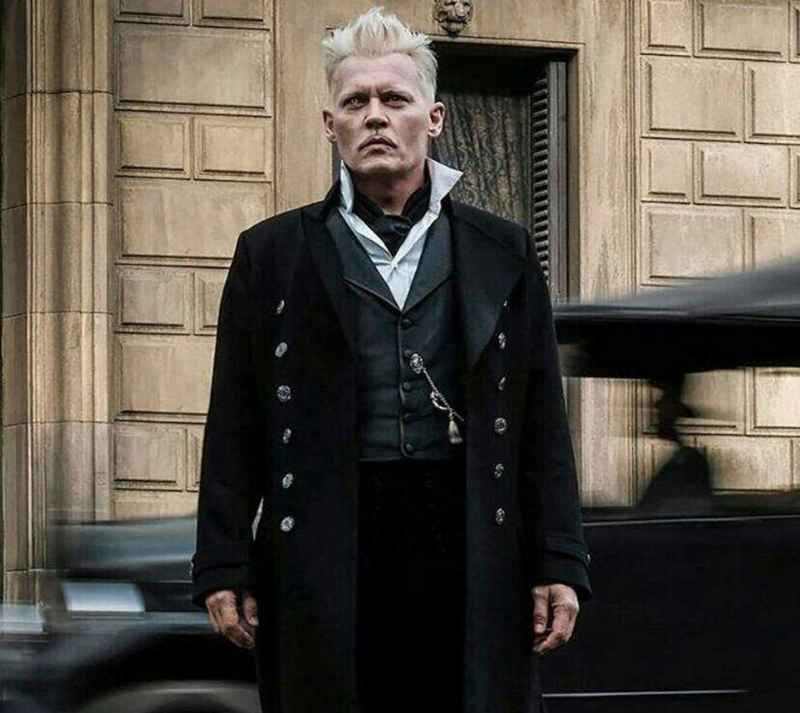 Gellert Grindelwald knows how to look fab while doing evil, brainwashing his minions, and conjuring rings of fire. We can't stop staring at that overcoat studded with silver buttons and lined with silk, pants with embroidered pockets, and a Niffler-friendly chain of curious trinkets. 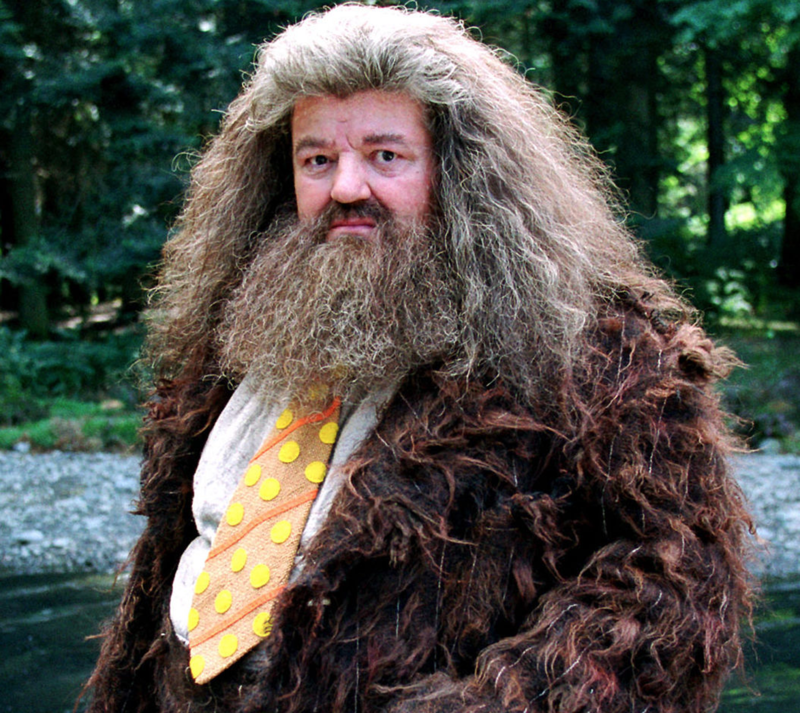 Could anything be more Hagrid than shaggy fur dress robes? Of course, there’s nothing better to match this beastly getup than an enormous tie with orange stripes and yellow polka dots. If any other wizard tried to get away with this, he’d get mistaken for something straight out of the Forbidden Forest. Glittering like a starry night with no Dementors, this is the little black dress to end all little black dresses. Look closer to actually see all the whirlwind of tiny fabric flowers floating across the lace overlay. Every girl who has ever found herself in a problematic bridesmaid dress wishes she could have summoned this one with a wave of her wand. This isn’t the kind of vintage find wizards would be Instagramming if they all had smartphones, but the kind of vintage that looks (and smells) like your great aunt Tessie: brocade duster, pink lace, houndstooth vest, green bow and way too many ruffles. Anyone brave enough to cosplay this version of Ron should win an award. When your job is investigating anything that could turn into front-page gossip for the official tabloid of the wizarding world, you have to wear something at least mildly cringe-worthy. Skeeter’s suit was inspired by the sleazy tabloid reporters of the '40s. Puffs of red feathers on acid green silk make it one of those eyesores you mysteriously can’t look away from. Never mind that she’s a Ravenclaw. Luna obviously has House pride for her friends when she shows up to a Quidditch match in a headpiece that almost appears to be alive. 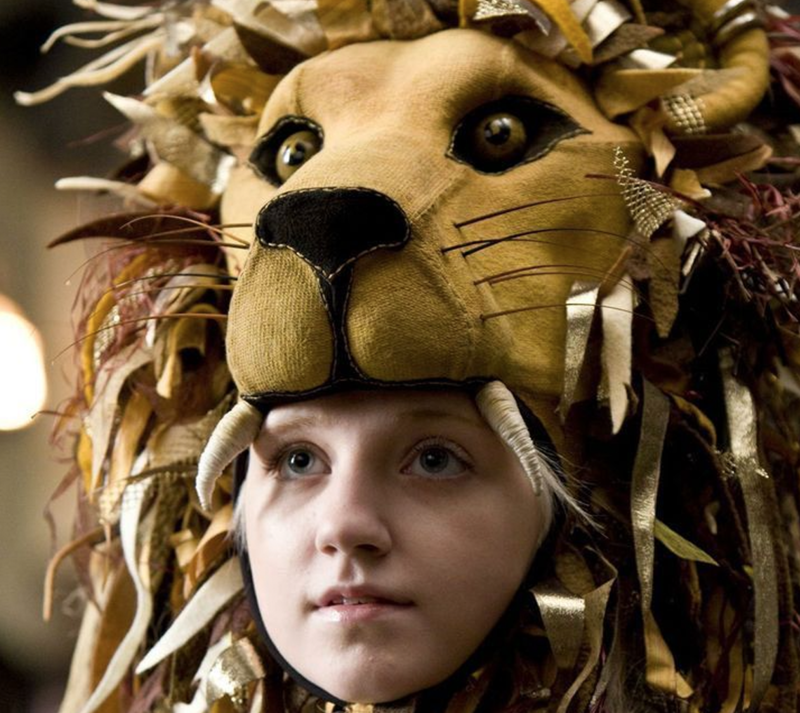 While it doesn’t actually roar, the hat was made partly by actress Evanna Lynch, who spent most of her downtime with the costume designers. Leather? Check. Corset? Check. Black? Check and check and check. 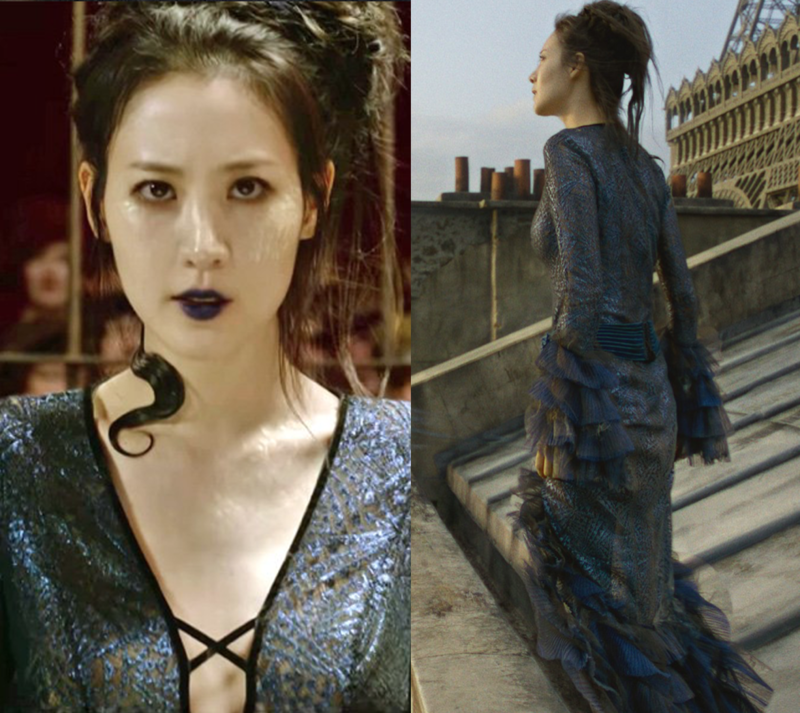 There is no other color the homicidal cousin of Sirius Black possibly could (or would) wear, and the Victorian and Medieval details are supposed to be an homage to her ancient and prestigious family of Purebloods. However cringe-worthy that sounds, it’s still painfully cool. Yes, the dress Luna wears to the Slug Club party looks kind of like an alien Christmas tree, which is exactly why it’s just so spellbinding. It was purposely designed to look like one (just think of what someone just as sane as Luna would wear) down to everything but the ornaments. Her earrings more than make up for that. 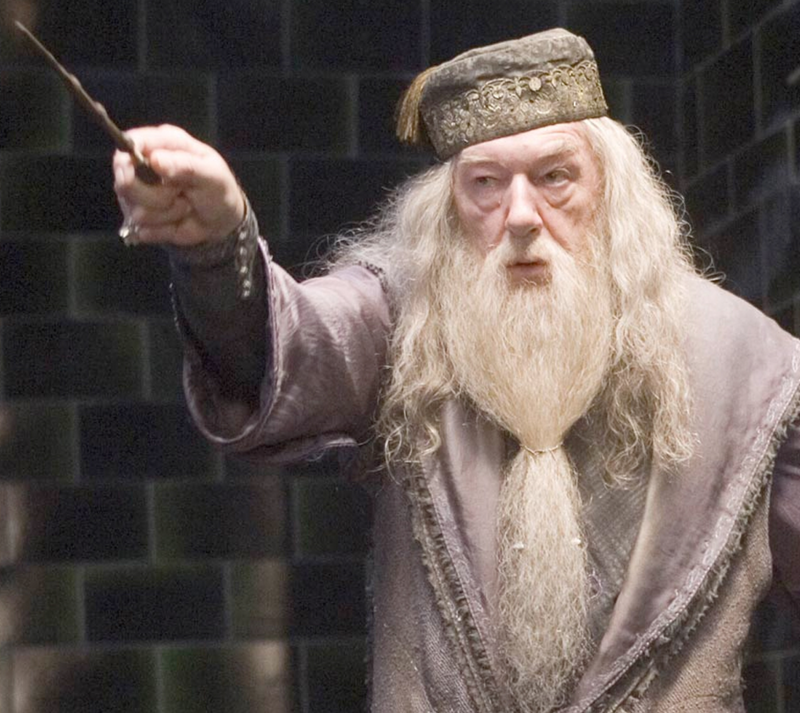 The most powerful headmaster that Hogwarts has ever seen deserves something that makes him look like a wizard, and there is a certain mystical quality to his shimmering silver robes, which almost make him seem like an entity from another dimension. No shade to Richard Harris with his red finery, but this color just looks more right on Dumbledore. As a Maledictus, Nagini is doomed to lose her humanity for scales and fangs, so her dress just had to have an understated reptilian feel to it, even if she never sparkles in her snake form. Glimpses of the pattern are like a premonition. Even the layered ruffles are something like a much more glamorous take on a serpent shedding its skin. 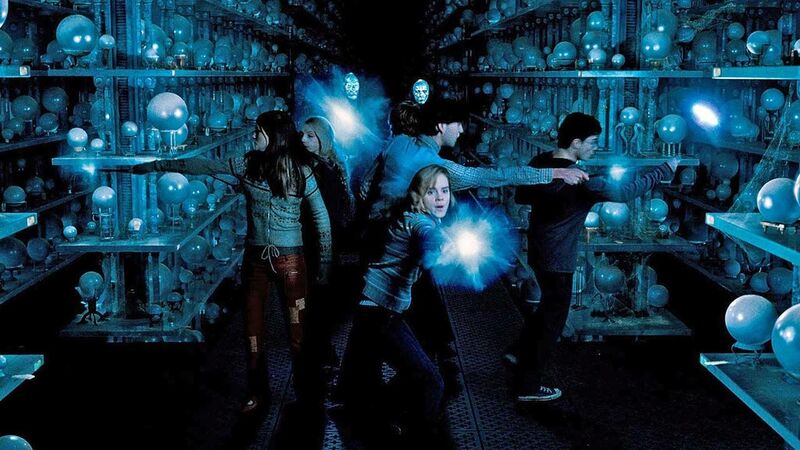 If you can forget all the green flashes of Avada Kedavra that accessorized them, these masks are way beyond anything you’d find in a party store around Halloween. Artist Rob Bliss went full-face with the masks because he thought it would be that much creepier. The intricate engravings were inspired by rich fabrics like Mogul Arabesque patterns. When she's not wearing an impeccably tailored pantsuit, the president of the Magical Congress — America’s answer to the Ministry of Magic — bewitches in velvet robes and an epic headpiece that puts pointed hats to shame. 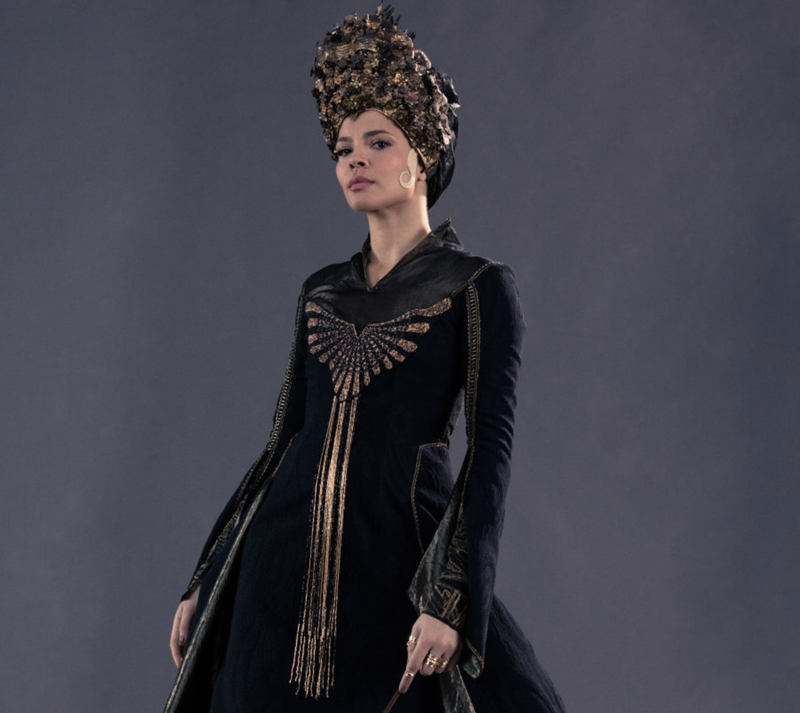 As for where to find it, Fantastic Beasts: The Crimes of Grindelwald costume designer Colleen Atwood had rediscovered the piece, inspired by an Indonesian wedding crown, in her storage room and gave it a makeover. Neither Grandma Longbottom nor the Potions Master could have anticipated Neville’s hilarious boggart. This is what happens when his greatest fear merges with the most ridiculous thing he can possibly think of. 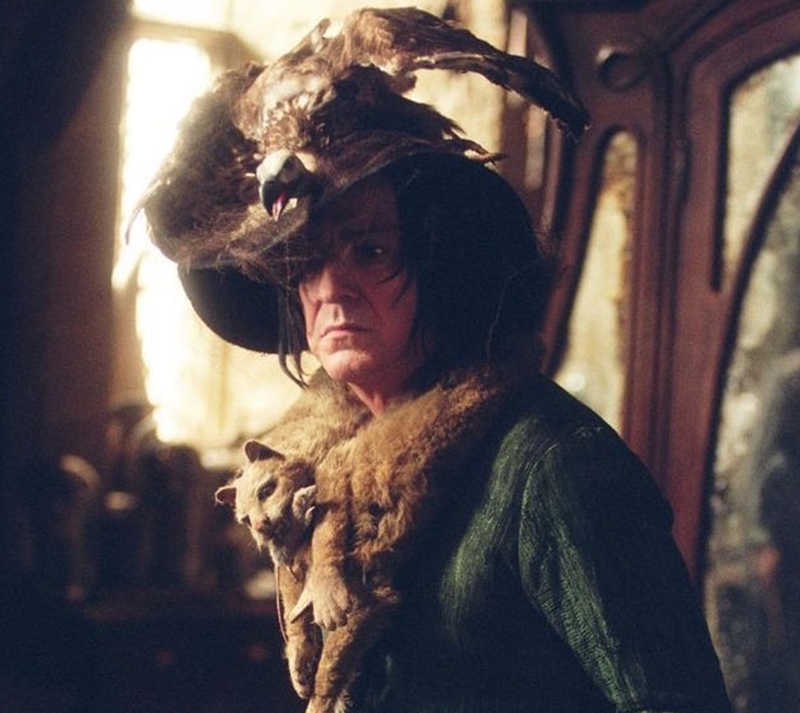 In a dusty tweed suit, cat scarf, red leather purse, and an entire taxidermy vulture perched on Grandma’s hat, Snape goes from nightmare to freak show.